What is XMLmind DITA Converter? Production-quality deliverables out of the box. A serious alternative to the DITA Open Toolkit. Out of the box, XMLmind DITA Converter (ditac for short) allows to convert the most complex DITA 1.0, 1.1, 1.2 or 1.3 documents to production-quality XHTML 1.0, XHTML 1.1, HTML 4.01, XHTML 5, Web Help, Java™ Help, HTML Help, Eclipse Help, EPUB 2, EPUB 3, PDF, PostScript®, RTF (can be opened in Word 2000+), WordprocessingML (can be opened in Word 2003+), Office Open XML (.docx, can be opened in Word 2007+), OpenDocument (.odt, can be opened in OpenOffice/LibreOffice 2+). 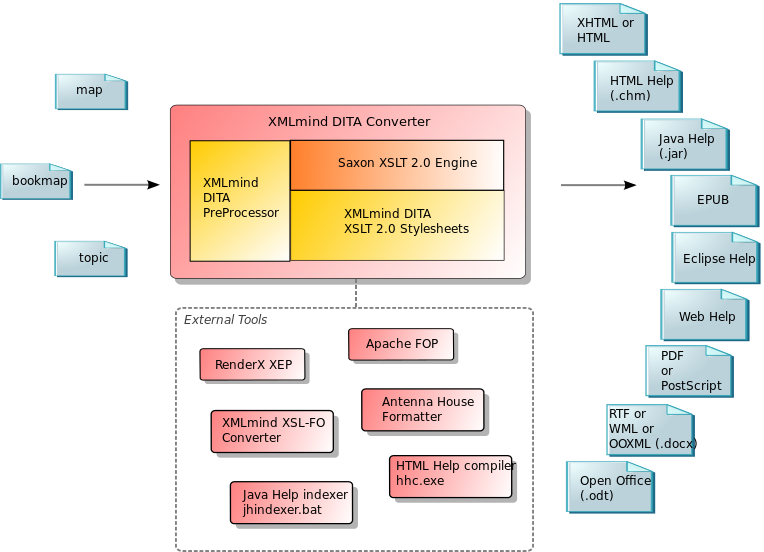 XMLmind DITA Converter is free, open source, software licensed under the very liberal terms of the Mozilla Public License version 2.0.